If you have an absolutefavorite spot on Mars, NASA wants to know. The agency may even take a snapshotfor you with its most powerful camera circling the red planet. NASA is taking publicsuggestions for photo targets on Marsusing the HiRISE camera on its Mars Reconnaissance Orbiter. The ?HiWish?project, announced Wednesday, allows the general public to choose a location onMars from a map on the Internet for HiRISE to photograph. But there?s a catch. Merelyasking for a photo won?t cut it. Requests must be accompanied with a title forthe snapshot and a brief explanation of what scientific benefits may come fromthe Martian photo shoot. Suggestions also need to be categorized in one of the18 science themes for the camera?s mission at Mars. The highest-priority suggestionswill zoom to the top of the list, project organizers said. There is already abacklog of thousands of targets requested by scientists and students waiting for HiRISE to photograph, they added. ?TheHiRISE team is pleased to give the public this opportunity to propose imagingtargets and share the excitement of seeing your favorite spot on Mars atpeople-scale resolution,? said HiRISE principal investigator Alfred McEwen ofthe University of Arizona in a statement. HiRISE, short for High-Resolution Imaging Science Experiment, is the workhorsecamera for the Mars Reconnaissance Orbiter, which has been studying Mars sinceit arrived in orbit in 2006. The camera has taken more than 13,000 photographsof the Martian surface during that time, but still only covered 1 percent ofthe planet, mission managers said. The camera is responsible forsome of NASA?s most stunning views of Mars, including a recent batch of imagesthat included a photograph depicting dust streaks that looked uncannily like Martiantrees. But the view was just an optical illusion, mission scientists said. Nicknamed ?the people?scamera,? 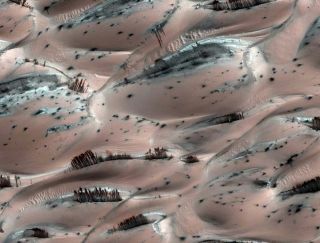 HiRISE is capable of photographing objects as small as a desk on Mars,with each image covering dozens of square miles. Internet denizens can mark theirfavorite part of Mars on a? map at the HiWish project?s Web site - http://uahirise.org/suggest/- to request a photo. ?Theprocess is fairly simple,? said HiRISE systems programmer Guy McArthur, also atthe University of Arizona, who helped build the interface with researchers atNASA?s Ames Research Center and the SETI Institute. ?With the tool, you canplace your rectangle on Mars where you?d like.? TheMarsReconnaissance Orbiter is the most powerful spacecraft ever to observe thered planet from orbit. Since its launch in 2005, the spacecraft has collectedmore photos and data of Mars than all other missions to the red planetcombined, NASA officials have said. NASAengineers recently revived the spacecraft from a months-long coma caused by acomputer glitch. The orbiter resumed normal observations of Mars in December.